We had our first big New England snow storm of the year! I snowed for an entire day and gave the horses some wonderful footing in the paddock! 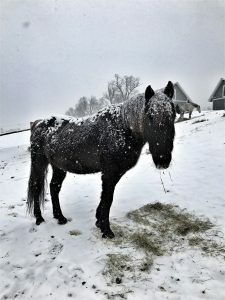 The horses were playful with each other in the snow and almost all of them rolled around giving themselves ‘snow baths’ as Alicia likes to call them. The snow is fluffy still because we are going through a bit of a cold snap. Very early to have this type of weather but we certainly don’t mind it. We, and the horses, much prefer snow to rain.